Back in history, the ancient people in Greece and Egypt have used Parsley wreaths to give honour to brave soldiers. In Greek mythology, Heracles was crowned with parsley wreath after defeating the Nemean lion. Parsley was believed to be originated from a hero's blood named Archemorus. There was even a story told by Homer that the horses of chariots of the army which won a war ate parsley and so they have been stronger and faster. In the story Odyssey, Circe's garden had a lot of parsley. The essential oil of Parsley is derived from its seeds, roots, and leaves. The oil may be pale yellow in color but usually it is colorless. The bitter aroma of the essential oil is stronger than the fresh parsley plant. The seeds extract more essential oil compared to leaves and roots but it is more potent if the oil is extracted from the whole plant. 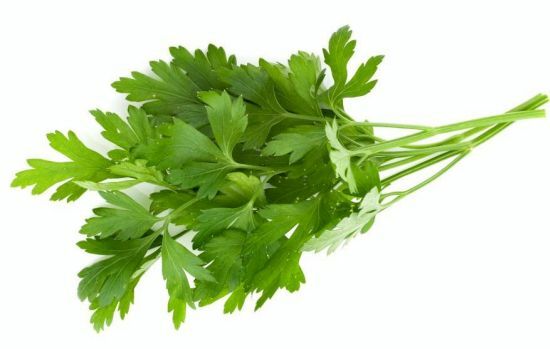 Research has also shown that Parsley contains myristicin, which can prevent development of abnormal growths. Parsley essential oil was found to have chemoprotective properties, meaning it can increase the resistance of a patient from harmful side effects of the anticancer drugs he is receiving. Although fresh parsley leaves may be eaten or included in facial masks as well as other DIY natural home remedies, the same cannot be said for parsley essential oil. Parsley essential oil may be combined with orange, clary sage, rose, ylang-ylang, and tea tree oils. Get Your Parsley Essential Oil Now! A very nice oil, with a mild herbaceous parsley aroma.I intend to blend with other spice oils for soaps as it has antiseptic properties.